Critter Corner: Three bears and Georgeson Botanical Garden. Bears, what needs to be said? Large, viscous, cute, curious, smart, omnivorous, powerful and today, wooden. Bears in Denali National Park got a lot of attention this year, when a hiker photographing a grizzly was mauled to death last August. Remarkably, this was the first fatality in the Park’s 95-year history. Bears are incredibly fast, and the estimated “50 yards” between the bear and his victim leaves little room for evasive measures. Keep your distance. 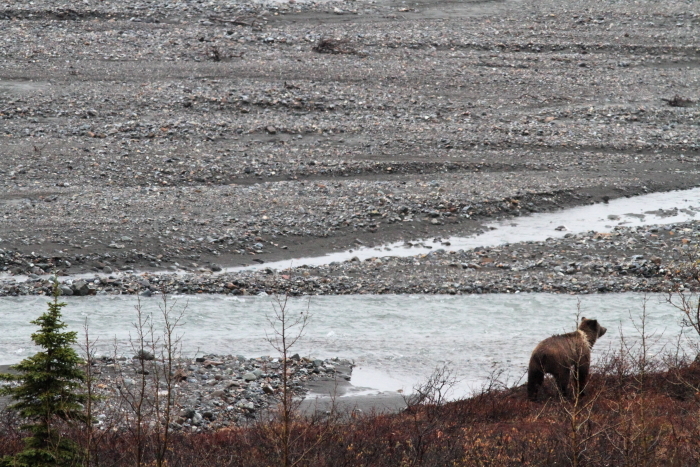 Keeping distance wasn’t a problem during the Denali Park Lottery last September. This Alaskan lottery allows 400 vehicles a day to drive all the way into the park, a trip usually reserved for tour buses. Park Rangers are fast to converge on eager photographers, keeping them safe distances from wildlife. 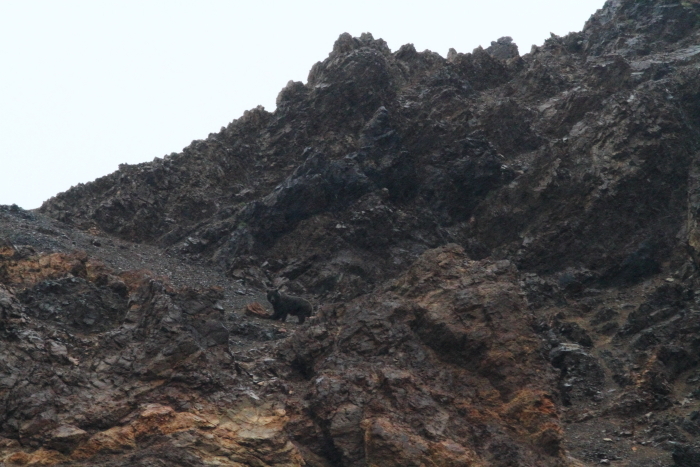 A bear pauses while climbing a steep, rocky slope. 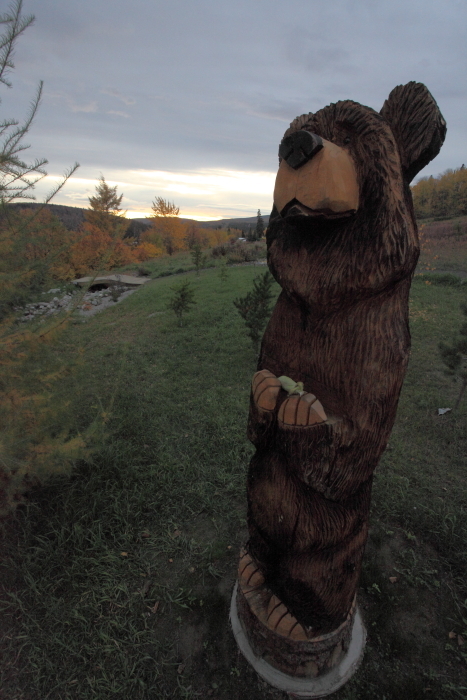 For some slightly different bear action, check out this statue of a bear at UAF’s Georgeson Botanical Garden, the northern-most botanical garden in North America. I hadn’t walked through in awhile, and found lots of lovely sculptures had been added. What originally caught my attention, though hard to see in the picture, was an ear of corn someone had placed in the bears paws, reminding me of the fall harvest. 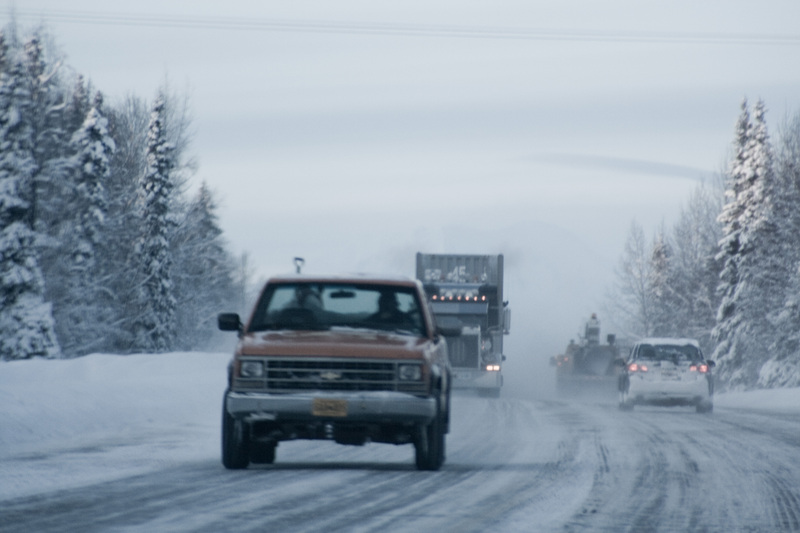 The Richardson Highway is 368 miles of pavement connecting Fairbanks, Alaska with Valdez to the south. The highway is typical of those found in Alaska: crossing mountain ranges and a very steep pass, with the occasional view of a glacier. Also common among many Alaskan roads, wildlife viewing. 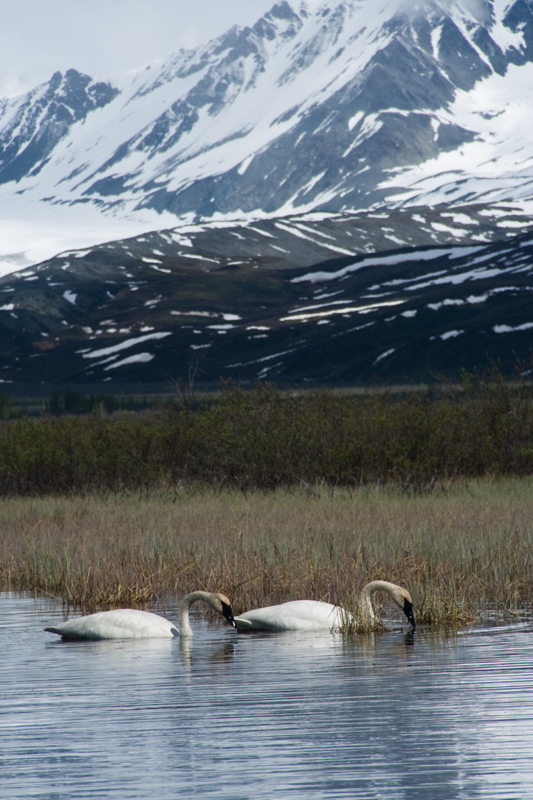 A trip down to Valdez earlier this summer brought multiple sightings and photo opportunities of swans. 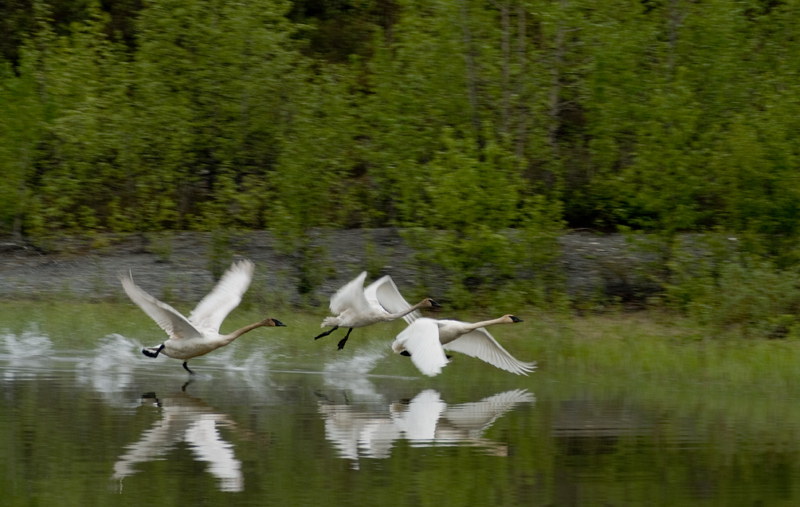 The first group of the birds were farther off the road and didn’t allow me to get very close before taking flight, but offered me a nice action shot in the process. The second group, much closer to the road, was far to concerned with eating to be spooked by my presence. Then, after a few minutes of photographing, I got that unique shot photographers hope for. 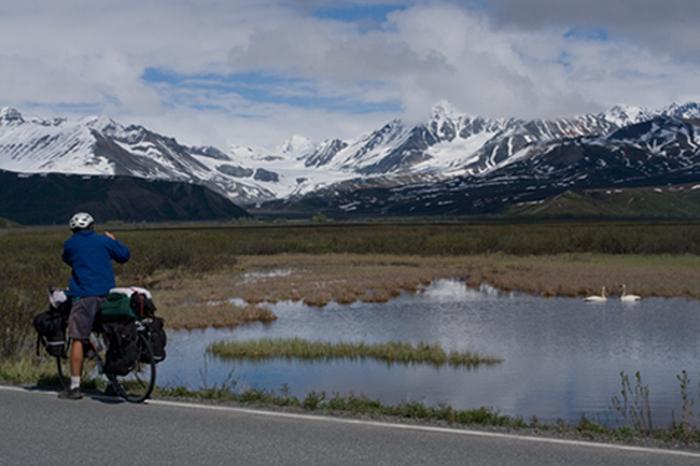 There in remote Isbabel Pass, more then 100 miles south of Fairbanks and with Gulkana Glacier in the background, a long-distance biker seemed to come out of nowhere, stopping to take a picture himself. Unfortunately without the preceding picture one easily looses the beauty of these large, graceful and powerful birds. Alaska’s highways are often beautiful. And often terrifying. A diptych is two photos that attempt to tell a more complete story then just one. 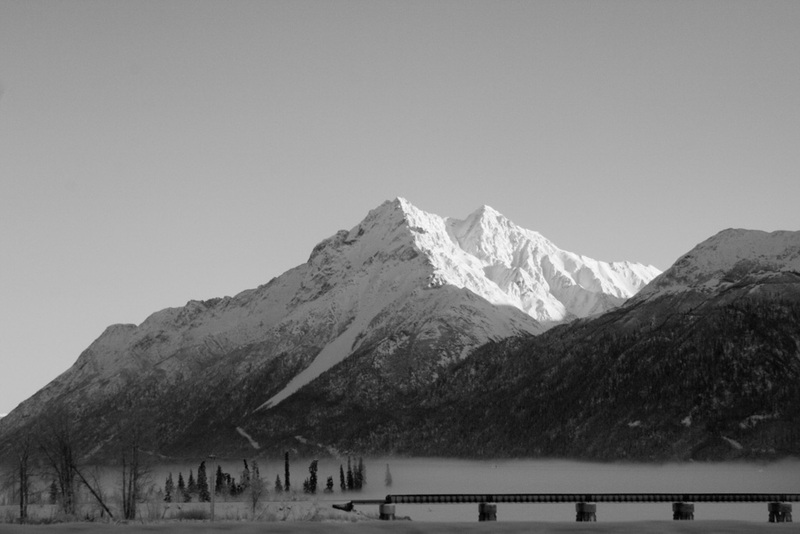 These two were taken just outside of anchorage on the Glenn Highway in early January, I wanted to capture a classic Alaskan view, and the feeling of impending death that often accompanies winter driving.